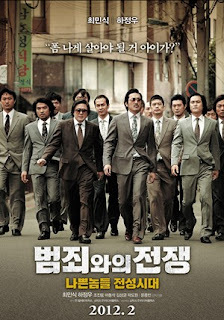 Though not a perfect film, Yoon Jong-bin's period gangland saga Nameless Gangster was one of the most purely cinematic films of the year. The richly evocative mise-en-scene and the brilliant cast featuring a magnetic, though odd, performance by Choi Min-sik, a cool-as-ice turn from Ha Jung-woo and a scene-stealing Kim Sung-gyun, lift up a plot that is far from original. However, it is not the story that matters here but the atmosphere and the film's examination of social etiquette and hierarchy. A great example on genre cinema, Nameless Gangster is an excellent commercial feature.